Staatsburg, N.Y. — On Sunday, August 26 at 10am, historian Kjirsten Gustavson will present “Women on a Wheel” at Staatsburgh State Historic Site, a program that combines history, costumed interpretation, and a short bike ride through the hamlet of Staatsburg, which surrounds the Gilded Age mansion on the Hudson River. 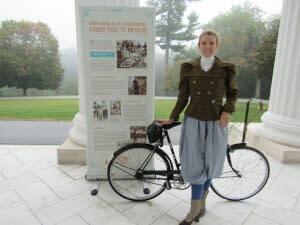 Ms. Gustavson, a historian who also creates her own period clothing, gives her presentation in a reproduction 1890s bicycling outfit, while exploring the connection between the bicycle craze and increasing freedoms sought by women, including the vote. After a short presentation, visitors will be invited to jump on their own modern-day bikes to join Ms. Gustavson on an easy 30-minute trip on the estate’s carriage roads and in the nearby hamlet. (The bike ride is optional, and people are welcome to attend the presentation without the ride.) Refreshments will be served at the ride&apos;s end. Helmets are mandatory for children 14 and under. Inclement weather will postpone the program to Sunday, September 9. The program costs $5 per adult and $1 per child. Tours of the mansion at Staatsburgh will be available at 11:00 am, for a separate admission fee. “This is a fabulous and fun program that combines history and physical activity, and is thus perfect for a family experience. It’s also set in a stunning location,” says Pam Malcolm, Staatsburgh’s site manager. Reservations are required and can be made by calling (845) 889-8851, extension 336. The New York State Office of Parks, Recreation and Historic Preservation oversees more than 250 parks, historic sites, recreational trails, golf courses, boat launches and more, which are visited by 71 million people annually. A recent study found that New York State Parks generates $5 billion in park and visitor spending, which supports nearly 54,000 jobs. For more information on any of these recreation areas, call 518-474-0456 or visit http://www.parks.ny.gov/, connect with us on Facebook ,or follow on Instagram and Twitter.